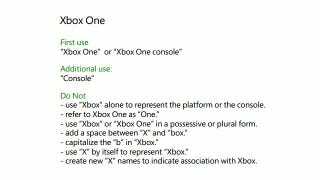 The "brand guidelines" for the new Xbox One have been published by Microsoft, and while they're intended for use by people like advertisers and partners, there's still some good stuff in there for people like you and me. For starters, there's information on logos and fonts, in case your ideas for photoshop jokes must be 100% accurate. Of more interest, though, is Microsoft's official nomenclature for the new console, dictating what it can and cannot be called. Obviously, in most cases, you call it the Xbox One. But you may also call it "console". Or "Xbox One console". Sadly, Xbone did not make the cut. What you must not do, under any circumstances, is call it the "One". HTC's lawyers are watching. You must also never simply use "Xbox", because that would be confusing. And if you try and create new "X" names to associate with it? God help you.